Join us at our engaging and interactive Seders on both nights of Passover, April 19 & 20. Connect, dine, and be inspired with fellow Jews at the Park Slope community Seder where we'll seamlessly weave ancient wisdom and contemporary commentary, and facilitate engaging discussion. 8:30 pm at Congregation B'nai Jacob, 401 9th St.
Join us the first night of Passover for traditional community Seder with a refreshing modern twist. Relive the exodus, discover the eternal meaning of the Haggadah, and enjoy a warm communal Seder complete with hand-baked matzah, wine, and a 4-course dinner. $60 per adult | $25 per child. No one will be turned away due to lack of funds, sponsored seats available. Select the "Discounted" ticket option. You're invited to join a classic, traditional Seder in the home of Rabbi Shimon and Sara Hecht on the second night of Passover. 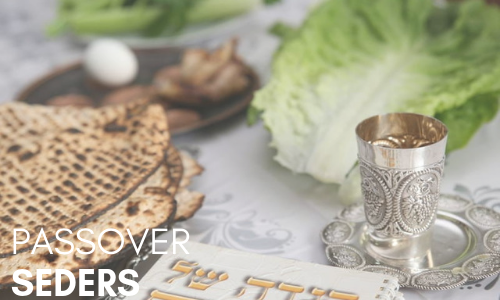 Relive the exodus, discover the eternal meaning of the Haggadah, and enjoy a community Seder complete with hand-baked matzah, wine, and a wonderful dinner.